“The Fog of War” is an apt and descriptive term, says Robert McNamara, Secretary of Defense under Presidents Kennedy and Johnson. To him, it describes the notion that war is such an incredibly complex event that there’s no way to see through to any single, objective explanation. Nevertheless, Errol Morris’ filmed interview with McNamara sheds a lot of light on the Cuban Missile Crisis and the Vietnam War, of which he is said to be an architect. The fog of war shrouds any true understanding of either event, but after watching Morris’ film, you’ll feel a lot smarter and better informed about both. There are visual jump cuts showing where the interview has been edited, but the conversational flow of McNamara’s narrative is smooth. His story is told chronologically, although there are jumps in time as McNamara flashes back to explain a bit of history. Morris breaks the visual monotony by cutting to extremely well-researched archival footage, computer-generated montages, or his unique photography of vintage things (like a closeup on an IBM card sorter, or an aerial map of World War II targets). Throughout, Philip Glass’ music adds aural texture without being too insistent. What really makes The Fog of War interesting is McNamara’s insight. For example, one of his lessons is “Empathize with the Enemy.” If you understand your foe, you know how he will act, and you can prepare accordingly. During the Cuban Missile Crisis, McNamara recalls Tommy Thompson (the former U.S. ambassador to the Soviet Union) bravely disagreeing with President Kennedy on how Kruschev would act. Kennedy listened to his advice because Thompson had stayed with the Kruschevs; It turned out Thompson was exactly right. Another pearl of wisdom is “Get the Data.” At Ford Motors, McNamara’s group invented the seat belt largely as a result of McNamara asking how people were dying in automobiles. Once they understood the numbers they saw how to change them. Under “Maximize Efficiency” McNamara tells of an early strategy in the Second World War. The U.S. was flying fuel across the Himalayas, and stockpiling it in China. From there, the fuel carriers would fly a bombing run to Japan before flying back to bring in a new load of fuel. But in order to make it back across the Himalayas, the planes would often have to refuel in China, reducing the stockpile. Once the inefficiency of flying over the hump was pointed out, the operation was moved to the Marianas and U.S. operations became more successful. Morris’ portrait of McNamara’s career is mostly flattering. Successes get attributed to McNamara while failures seem to come from those who fail to follow his advice. However there are some notable failures in McNamara’s career that are even more apparent if you’ve seen the 1972 documentary Hearts & Minds, about the Vietnam War (whose title, ironically, comes from a famous speech by McNamara). 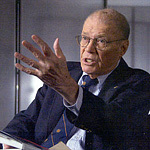 In it, many Vietnamese go in front of the camera and say “this is a civil war, it’s not about Communism.” In The Fog of War, McNamara says he returned to Vietnam in 1995 and was genuinely surprised to hear the Vietnamese were not grateful for America’s help fighting the Communists; that they saw it as a civil war. Is McNamara being disingenuous, or was he really that deaf, that unable to empathize with the enemy, during the Vietnam War? His story offers some uncanny lessons for our time. There are notable parallels in the widely debunked Gulf of Tonkin incident, which for many politicians justified military intervention in Vietnam, and the flimsy evidence that for many politicians justified America’s involvement in Iraq. He says that we should never apply our power — economic or military — unilaterally. Regardless of how you see McNamara and his 11 lessons, The Fog of War is informative and engaging. Don’t miss it.